I only went to São Vicente de Fora monastery because I’d heard it had a good viewpoint. “It’s the best view of Lisbon,” promised the man on reception, “But before the view, there is all this to see,” he said, waving his hand towards a faded poster showing the highlights of the museum. At this point, I was still only really interested in the view but set off with an open mind to explore the monastery. The first thing to impress me was the grande baroque style entrance hall, still doing its job after hundreds of years. 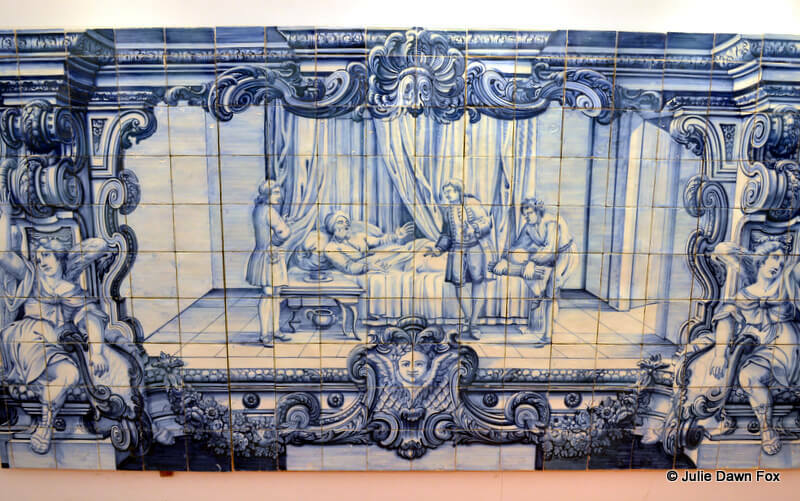 Panels of blue and white azulejos painted with full-length portraits of kings adorn the walls. The floor is a mosaic of coloured marble and the low vaulted ceiling is cleverly painted with a 3-D effect that creates an illusion of height. 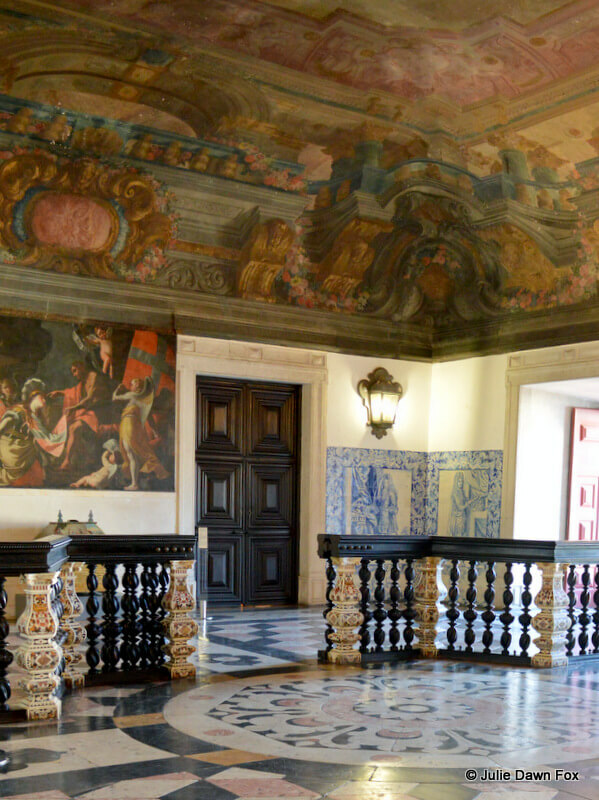 Very grand baroque entrance hall, São Vicente de Fora Monastery. 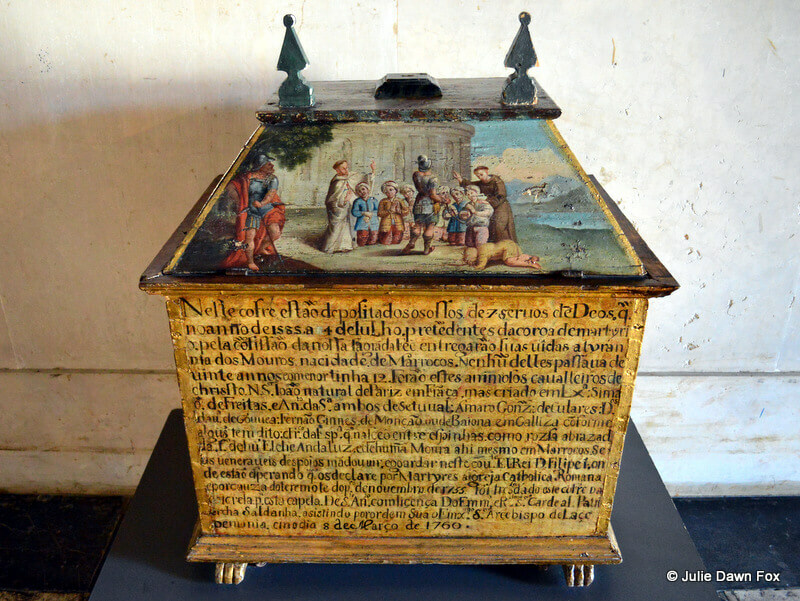 There’s very little furniture in the entrance hall but this reliquary chest caught my eye. It contains the bones of several 16th century martyrs who were killed trying to spread Christianity in Morocco. 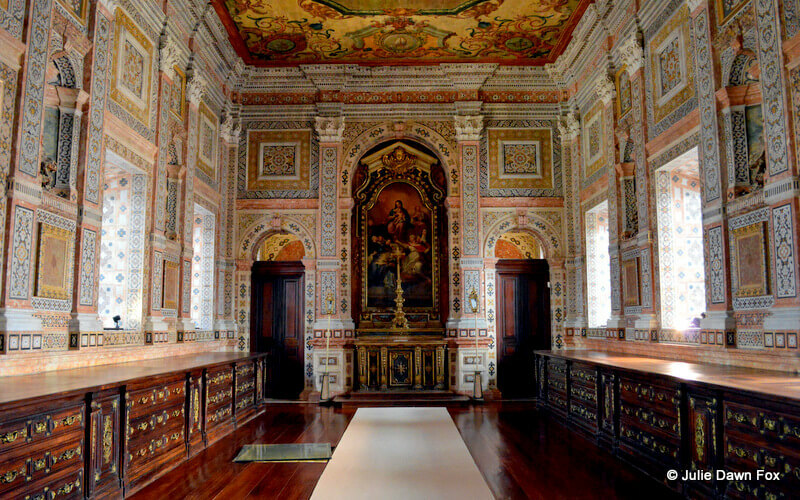 I spent very little time in the religious history section but if anyone’s interested in finding out about the history of the Catholic church in Portugal, there’s plenty of detail and artefacts here. Even though I didn’t linger, I couldn’t help noticing that the full set of priestly robes includes matching socks and booties. Also worthy of note, in my opinion at least, is the Jesus doll which comes with 25 different outfits. I passed through the cloisters, stopping occasionally to admire the scenes depicted in the azulejos that line its walls. Everything from rural life to royal events is covered in these paintings, providing a fascinating insight into life in 18th century Portugal. Moving on, the pantheon holds some rather impressive royal tombs. 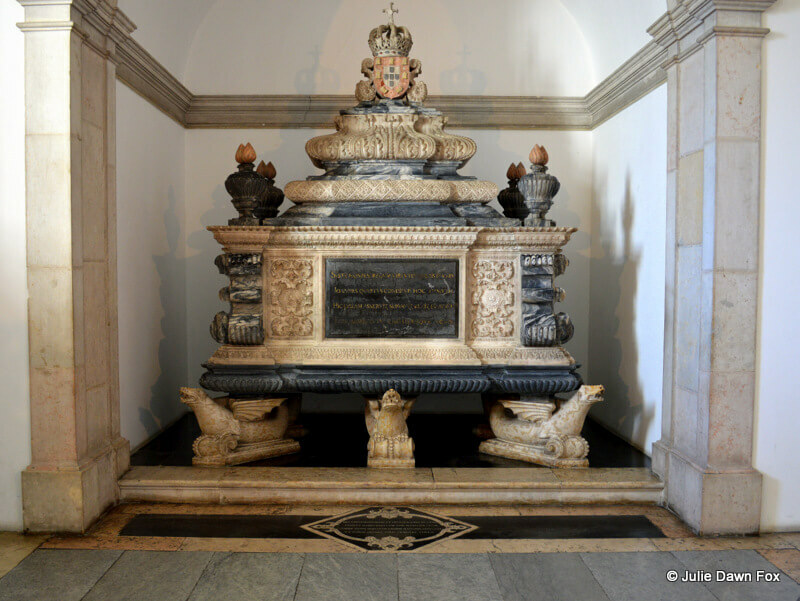 The marble tomb of Dom João IV rests at the head of the pantheon in São Vicente de Fora. One of the highlights for me was the sacristy. 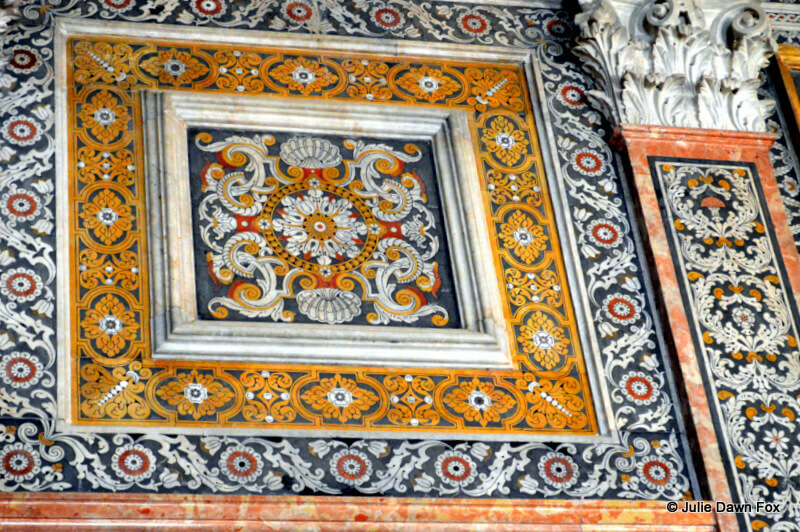 Floor to ceiling coloured inlaid marble decorates the walls and the ceiling is a giant oil painting. The two beautiful wooden chests used to hold the vestments and the room served as the priests’ dressing room. 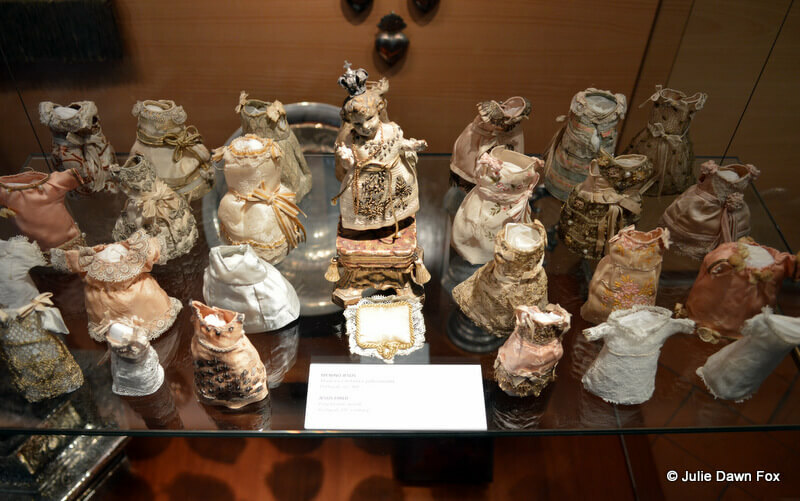 I paid scant attention to the collection of shells housed in a side room and offered a cursory glance at the fragments of cloth and ceramics on display. An old man gathered his children around his deathbed and said, “My children, try to break this bundle of sticks without untying them.” Each of them tried, from the youngest to the oldest, but not one of them was able to break the bundle. Next, the old man untied the bundle and broke each stick individually. A very clever way of getting the message across that they should stick together (pardon the pun). Once I’d had my fill of moral tales, I did what I originally came here for and climbed the stairs to the rooftop. The day I visited was stormy indeed so the view, whilst impressive, was not as far-reaching or clear as it might be. I battled the wind and grabbed some photos before huge splats of rain forced me back inside. As you can see, there’s a lot more to the monastery than great views, especially if you like azulejos (hand painted tiles) and marble. If you come on a Tuesday or Saturday, you could combine your trip with a nosey around the famous Feira da Ladra flea market which takes place behind the church. I’d also recommend going to the nearby National Pantheon for yet more amazing marble, noble tombs and stunning views. Not sure where to stay in Lisbon? Click to read about which city centre areas make the best bases. São Vicente de Fora monastery is to the right of the church steps in Largo de São Vicente in Graça. Take tram 28 and get off at the Feira da Ladra (Flea market). It’s open every day except Monday from 10 am to 6pm with last entry at 5pm. Entry costs 4 euros with no discounts for Lisbon Card holders. Previous Post: Why Is Golf In Portugal So Popular? It’s even better in real life, Cat! If you like marble, you should definitely go to the National Pantheon too. 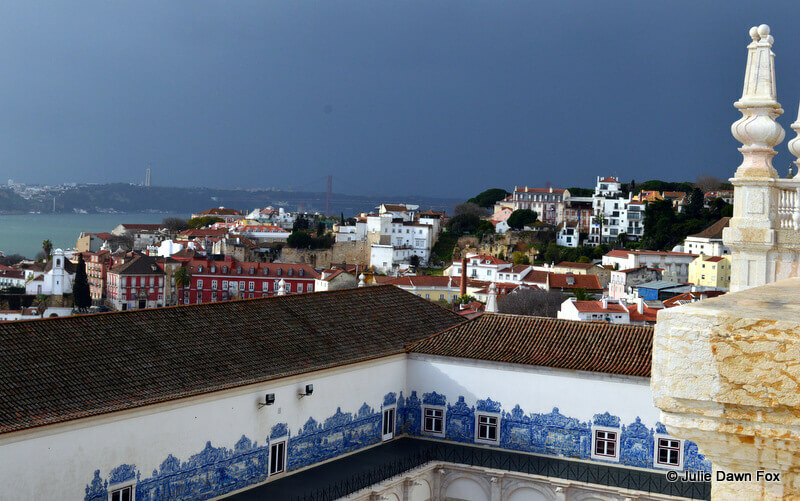 Very nice coverage and photographs of the monastery and Lisbon, Julie. Thank you Stefano, I’m glad you liked it. Absolutely stunning, I’m just sorry to have missed it when I visited Portugal last year. I became positively obsessed with the azulejos and it looks like there were some incredible ones here. To think that they were all hand painted is just mind boggling. I know, they must have taken such a long time to paint. I especially liked that there was some explanation of what they represent as it’s not always obvious and they just become a blur of historical scenes otherwise. Beautiful! Definitely gives me more reason to travel to Lisbon again! Thanks, Cat. I can give you plenty more reasons, too! Great photos and information about the Monastery, Julie. I never visited it and will have to go there next time I to to Portugal. Hi Sami, I was surprised and impressed by it as I’m not usually overly excited by monasteries and churches. I hope you like it when you go there! Wow to the view, and the artefacts! I can appreciate the stitching in the robes, but wouldn’t even begin to consider doing any of the stitches EVER again! It was enough to try them at college. As for the doll clothes – I’ve never seen anything like that before. 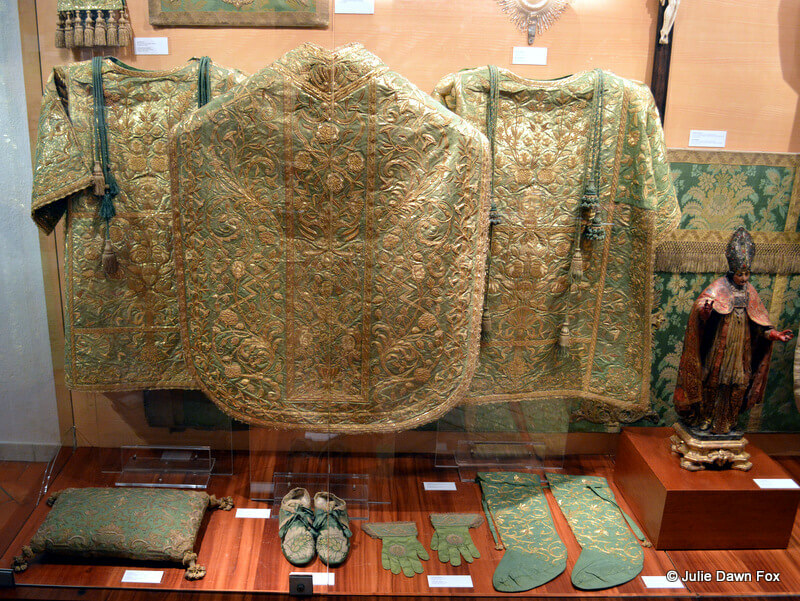 You’re right, it must have taken such a long time to embroider all those clothes. The doll was a new one on me, too, but I’ve since come across it elsewhere. Hi Marion, I hope you like it! I really enjoyed the national Pantheon, which is just downhill from the monastery (blog post in the works). If you’re in the area and have time, it’s worth popping in and climbing to the top. You can decide for yourself which gives you the best views of Lisbon!